On April 19, 2017 – the 52nd anniversary to the day of the official signing of New York’s pioneering Landmarks Law of 1965 – LW! President Kate Wood gave a talk to nearly 200 members of the National Arts Club and guests on the past, present, and future of landmarks preservation on the Upper West Side. The National Arts Club provided the perfect setting. 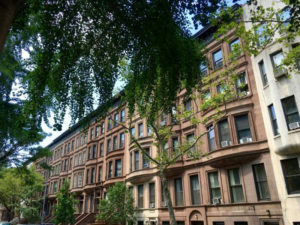 A rare example of a “landmark trifecta,” the Club is not only a New York City Individual Landmark, but also protected as part of the Gramercy Park Historic District, and designated as a National Historic Landmark. Kate called her talk “How the West Was Won,” but she gave it an impromptu subtitle: “The Case for a New Upper West Side Preservation Movement.” Connecting more than three decades of dots from 1980s tower threats to the long-time-coming designations of brownstone blocks, exceptional apartment houses, and stunning streetscapes to present-day mega-development, Kate argued that there is more reason than ever to rededicate ourselves to community preservation with all that we’ve got. Kate’s text and illustrations are available HERE!